The great state of Virginia recently tabled a bill that would have imposed a twenty cent charge on all plastic bags. It was sponsored by a delegate who referred to the bags as an “environmental menace” as he complained that two billion of them go into Virginia landfills every year. There is a problem with plastic bags, but it’s not with the bags themselves. It’s how we dispose of them. If dumped in a landfill and buried, they can last hundreds of years. However, if exposed to light and air, they break down far more quickly. That’s why I never throw plastic bags in the trash. I keep them in a small box by my front door until there’s a windy day. I then set all of them free. As they soar majestically into the heavens like a pack of white doves, I know I’m doing my part to save Mother Earth. If you live near the ocean or another large body of water you can also throw them in there. 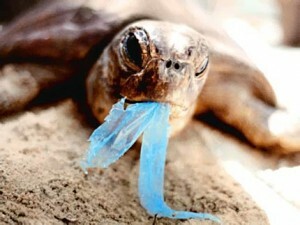 Seabirds and turtles often mistake the bags for food and will eat them. The bags can then safely biodegrade in their digestive systems. The last way to responsibly dispose of plastic bags is to burn them. If you have a fireplace or wood stove, twist the bags into tight knots and use them to cheaply and efficiently heat your home. Remember, you’re part-owner of this planet, too. When you do your part, we all win.